As part of the 5000+ program, five forums were held across Adelaide featuring the themes liveable city, green city, moving city, vibrant city, and leading city. The Australian Institute of Architects SA Chapter was asked to lead the Green City Forum. As Dr Angelique Edmonds was an AIA Chapter Councillor and Chair of the SA Sustainable Built Environment Committee at that time, she led the Institute’s role in this forum. This project provided a testing ground for the collaborative design of a public event, which aimed to prompt participants to think differently about environmental sustainability. The discussion and collaboration amongst the team designing the event was at times contentious and conflicting. All partners were fiercely passionate about environmental sustainability, and collectively sought to frame a conversation which would prompt participants to collaborate and commit to the behavior change necessary to ensure Adelaide’s future and identity as a Green city. The model, using a collaborative design approach for an interdisciplinary public event, was further refined in subsequent forums in 5000+, and now also informs the approach of the School for Creating Change. The 5000+ Green City Forum took place over two days at the Adelaide Zoo. Planning for the Forum began six months prior to the event, and went through many stages of design development. The Australian Institute of Architects SA Chapter were invited into the process as ‘lead conversation partner’ – designing the Forum in collaboration with other conversation partners (AILA, NRMB, ACC & GBCA) and the 5000+ team. The first day explored Adelaide’s relationship with the environment. During group discussions a scribe and an architect, or student of architecture, worked with each group to illustrate ideas as they were explored. This unique approach to capturing the output of the discussions and providing plenary feedback, was compiled into memorable visuals. These were presented during the following ‘Sustainable Feast’ of local and organic produce, when ideas were pitched to senior decision makers who were invited to join in the feast. Day two continued this work with the development of some initial ideas for implementation. The conversation partners, the 5000+ stakeholders, and many of the forum participants continued the conversation about a future Green City through design testing and demonstration projects, validated against best practice, and communicated through propositions to the wider community throughout the 5000+ project. 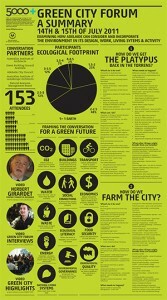 5000+ Green City Forum highlights from Office for Design + Architecture on Vimeo. 5000+ a green paradigm shift from Office for Design + Architecture on Vimeo. Green ideas:: post it on notes from Office for Design + Architecture on Vimeo.